The almost 800 Watts of solar panels on the van did a great job charging the battery on our recent trip. The charger took a little bit of custom configuration, but the menus were easy enough to work with and now everything works well. I started off with the default charge controller settings for a Lithium battery, but once the battery got close to full, the charger made the battery management system upset. The BMS wanted 13.5 volts float charge, the charger was producing 13.8. Not enough to hurt the battery in the short term, but something that I needed to take care of. If nothing else, I wanted to stop the BMS light from coming on! We have three 265W Grape Solar panels on the roof of the van. That doesn’t leave much space for anything else, but the panels do provide plenty of charging capacity for our battery. We haven’t got the entire interior in the van yet, so we’re not cooking and living off the house battery. However, based on what use we have had, the solar panels will be a great help in keeping us topped off. Something that the Victron products offer, which I’m going to look in to later on, is the ability to push any excess solar power back into the grid. If we are parked at home or at a friend’s house and our batteries are full, our solar panels can give power back to the house. The Victron inverter even has a built-in anti-islanding device to stop the power from flowing if there’s a power cut. That way, nobody working on restoring power gets hurt because of our solar panels. I work with Victron quite a bit in the marine industry but didnt know they made smaller stuff too. I was going to use the Magna because it can mix and match solar to shorepower to the batteries to inverting. Do you have any regrets or wishes as to the actual van itself? Do you wish you had gotten less windows/more windows instead? Any other features you would recommend or warn to stay away from? 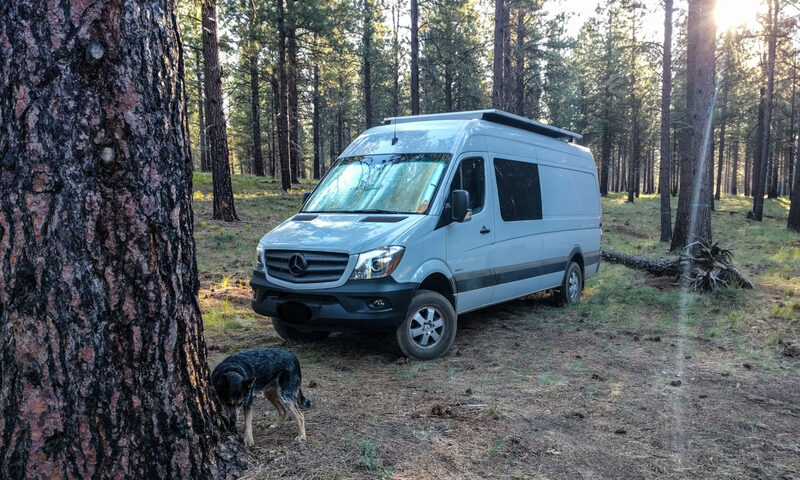 I list the options we got and what I think of them on this page, and you may have seen that we didn’t actually end up with the van we ordered. Having said that, we’re happy with the number of windows. I think we’d get blind spot assist if we could, and maybe a couple of the other driver assist items but overall the van is working well for us. So how big is your battery bank ? Having almost 1kw of solar is a serious waste if your bank is only 100-200 amp hours. They need to match or be slightly bigger than the bank. Dave, you can read about our battery bank here. It’s 700Ah/9kW so it’s large enough for the panels.